Contact our Professional Florida HVAC Services Now! Over the years, Broan-NuTone has developed a reputation as a global leader in residential air conditioning and ventilation technology. That’s why we here at Del-Air Heating & Air Conditioning proudly carry their products and can provide you with exceptional-quality installation, maintenance and repair services. Broan-NuTone has not only earned place as a leader in residential air quality products, but backed it up with numerous awards and accolades from prestigious institutions. They earned the coveted International Service Excellence Award from the Customer Service Institute of America for three consecutive years, showing their dedication to standing behind their products. At Del-Air Heating and Air Conditioning, we strive to have our business reflect the same steadfast willingness to back up our repairs and installation services. All of our friendly and experienced technicians are NATE (North American Technician Excellence) certified in order to provide you with knowledgeable and professional advice and services. Each technician is also trained in all of the latest brands and technologies, including Broan-NuTone systems, and they have recognized us for our consistent work with their products with the Outstanding Sales and Service award. Del-Air Heating and Air Conditioning mirrors and admires this dedication to environmental best practices. Each of our trained technicians is EPA-certified as well to ensure every service we perform not only makes your unit more efficient, but is done with environmentally-friendly products and techniques. As a result, you save energy and money with a durable and effective climate control and ventilation system in your home. Interested in installing a Broan-NuTone system in your home? 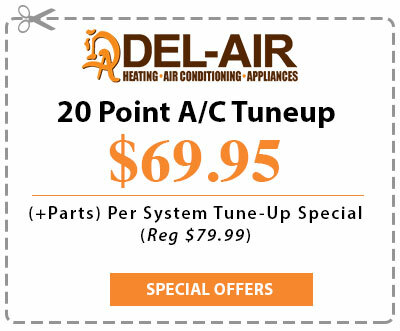 Call Del-Air Heating and Air Conditioning at (844) 574-4578 to schedule an appointment!